It is a love story. 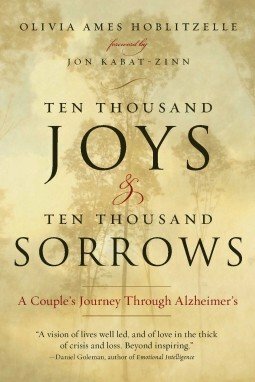 It is a love story written from the deeply touching and personal perspective of a remarkable woman living through her equally remarkable husband’s dementia and death. The book covers the six years from his first symptoms to his death as she emotionally lived the various pieces of their life together as it changed profoundly. The book is drawn from her journals, giving the reader the direct expression of her emotions as they went through her. The theme and tone of the book are both poignantly captured in a phrase that is the Postlude to the narrative, “Dance me to the End of Love,” a line drawn from a Leonard Cohen poem. The book is a dance in its delicate movement, its cadence and its intimate flowing emotion. The reader is watching lovers dance, from inside one of the dancers. It is sweeping love story between two extraordinary people who, as we learn from the book, and feel from its author, have each lived extraordinary lives. Available from: Amazon.co.uk or Amazon.co.uk Kindle Store, and Amazon.com or Amazon.com Kindle Store. The extraordinary qualities of the writer, of her husband and of their lives together are stamped throughout the book, from the jacket liner to the back cover. This entices the reader; gives a sense of wonder and awe to the experience of the close connection with their lives, their struggles and their needs, each of them, to come to so ordinary a thing as death. It is a strength of the book; two sparkling, talented people who lives have soared above us in a glorious flight of remarkable accomplishments, experiences, encounters, facing together an ignoble debilitating illness and the commonness of death. This also is a puzzle for the reader. What is so very extraordinary about the lives of the writer and her husband removes them from what is all too ordinary, the plight of most people and families who face the same challenge. When we bring to mind the estimated 5.4 million Americans who suffer from Alzheimer’s Disorder, and their 14.9 million unpaid caretakers we are carried to a different and less exalted reaction than the one we are left with at the end of this beautiful and extraordinary experience. Every family’s story, of course, is different and singular. What is incongruent is that we cannot conceive of most of these millions (millions that will swell in a few decades to tens of millions in what has been described as an epidemic) as extraordinary. We cannot conceive of these millions having the resources financially for the care that is described in “Ten Thousand Joys and Ten Thousand Sorrows”. We cannot imagine millions having the homes in Vermont and in Cambridge, Massachusetts. We cannot imagine millions with the support of a large network of loving and distinguished friends, and of renowned spiritual leaders. We cannot imagine millions dying peacefully in their homes surrounded by loving caregivers. In this way the ordinary and the extraordinary are juxtaposed too nearly. We suspect the wreckage of dementia on the many millions and their families is something quite different than what this book has told of. We suspect that so many die alone. We suspect that so many are broken by the financial impossibilities of good care. We suspect the isolation and loneliness of those families who cannot afford care, who chose to leave their jobs to care for their stricken relatives, whose world then becomes a small one of long and weary days and sleepless nights. We know of the number caretakers who die early, earlier than their loved one with Alzheimer’s. We know of those who live with Alzheimer’s much longer than the six years described so movingly by Olivia Hoblitzelle, many of whom, unlike her husband, dwell in silence or are unable for years to remember who is in the room with them or what they did or said two minutes ago. So we remind ourselves that “Ten Thousand Joys and Ten Thousand Sorrows” is a particular story about particular people. It is a tender and touching love story that can give us comfort and inspiration. It is not about us. But may still be a help to us. The “Suggestions” at each Chapter’s end may be practical reminders for some of us. The “Seed Thoughts” also at the conclusion of each Chapter will be consistently useful to us (“May I cultivate compassion toward myself and others”, May I find new ways of handling my negative emotions.” “May I accept the challenge of this situation”, “Let me be calm”). “Ten Thousand Joys and Ten Thousand Sorrows” is uplifting for us in the way that all stories of courageous struggle are. And it brings that us that sweet and painful poignancy of all powerful love stories. I’d like to thank you for this review. I have yet to read the book so I can’t comment on it’s contents. However, I feel very grateful to you for the everyday and realistic perspective that you bring to this review. My father died last year after suffering from Alzheimer’s for 18 years, having first shown symptoms in his late fifties. His journey was a very difficult and painful one and the limited resources of my family were very stretched by it. So I read your review with a strong sense of relief – we were just ordinary people facing a disease which robs it’s sufferers of dignity and identity and is deeply painful for those who care for the sufferer. At some time, I will read this book, but for now I would just like to thank you for remembering ordinary people and the pain and suffering that this disease can cause.